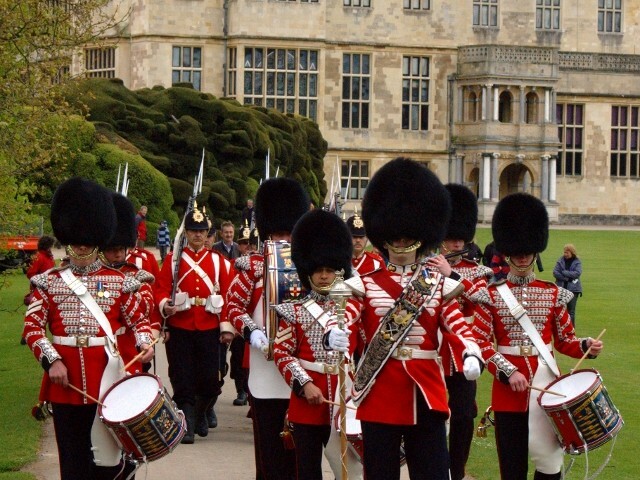 This weekend, Audley End House re-opened its stables for the first time in about 60 years. To celebrate, they reenacted a visit by Queen Victoria to inspect her troops with “All the Queen’s Horses”. Having horse lovers in the family, we had to attend. Unfortunately, the weather and the traffic did not cooperate well. We had another one of those Arctic spells move in, so the skies were overcast for most of the morning and it was raining hard at times. That made for a frustrating drive, as traffic always gets jammed through the Dartford Tunnel, even on a good day. By the time we arrived, the rain had moved off, but the grounds were wet and muddy, and the skies were still overcast. But the setting was so wonderful that I think we managed some good pictures regardless. Essex and Cambridgeshire are truly beautiful counties. You could almost forget that a road cut through part of the original estates of Audley End House. Set in a valley with rolling hills around it and the river Cam in front, it was amazingly picturesque. The English Heritage Society did a good job with putting together a show, and even though the turnout was low due to the weather conditions, the actors did not appear to grumble. Army encampment tents were sent up on the grounds with the Corps of Drums of the HAC, the 17th Lancers and the Diehards Company giving talks and displays during the “Grand Arrival” and the “Grand Parade”. Being a family event, they also had stalls for games for the kids. Needless to say, we spent most of the time getting up close to the horses. But, the wind picked up and it became quite cold. Our younger daughter started fussing, so we decided to go indoors. Unfortunately, it was too late to view the inside of the house, but the servants’ quarters were open. You cannot but feel overwhelmed by the immense wealth of the aristocracy.